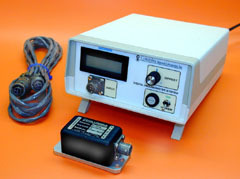 Columbia Models DIS-7001 and DIS-7012 Inclinometer Systems include a temperature-compensated force balance inclinometer in conjunction with a power module and convenient digital display. Linearization is supplied in the readout module which eliminates the need for conversion from the inclinometer sine output to degrees. Both systems are available with optional analog output via a BNC connector. The optional carrying case enhances portability. Consult the factory for customized versions of these systems. 115V, 60 Hz, 1 Amp Max. 10 Ft. (Standard Length) Optional Lengths: 5 Ft. To 50 Ft.